Under the beam of light that fell from the one window of the room, darkening the rest of this particular place, Abla Saniya, the seamstress, starts up her machine aware of making use of the last thread of daylight before darkness takes over the room. Abla Saniya turns on the electric light whose wire comes from the same window of which she pays five pounds every month for and which she takes great care in collecting, since her income melts into the smiles of her youngsters and the toils of everyday life. The room is not narrow and is considered a bargain on "Turk's Lane" because it's spacious. In the front, there's a kitchen. It has a bathroom. The rent is three pounds. Abla Saniya rented it years ago, at a time when rent signs were all over the streets, and she considered herself lucky because al-Muèallim Tahsin, the café worker, connected her to his electricity on the condition that his wife and children had priority for fittings. Seldom is it that those who pay the rent are a mix of those who can afford it and those who can't. During the last days of Ramadan women and children crowd Abla Saniya's room—they are the holiday clients. Abla Saniya sat finishing, sewing the last of a dark colored fabric in her hand. It had come to be that she couldn't sew dark fabrics with a light bulb. Somehow she had singled out daylight for that and the night for sewing light colored fabric. Scattered all around her are expressions that carry the small assurances of people of the neighborhood. "My dear Ms. Saniya, I want a hat for my small son from Aziza's dress." "As you like, Umm Muhammad." "Don't forget to double the hem so Shadia can grow into it." A young girl hummed, her voice sharpening alongside the methodical resonance of the sewing machine. "Abla Saniya? Abla Saniya? Do you have the pearls and trimmings?" She replied by way of a sarcastic guff, "You'll never know the troubles I've seen. . ."
As usual her maternal instincts got the better of her and she tossed the girl a cloth pouch. "Look inside, dear. In this bag is the cloth that you wanted." "Listen here young man, I'm not one of those girls, so look out!" He smiled and responded, "My intentions are honorable, but I know the way. . . "
She didn't go back again, meanwhile he kept asking after her until he found out about her family and asked them for her hand. But they all refused him, especially her mother who said: "Forget the admirer, Saniya. This guy will not take care of you." She didn't think her mother's heart was as perceptive as a machine that predicts lightening before it strikes, or registers the tremors before volcanoes erupt. So, Saniya married Madbuli and their wedding was one of the stories of the neighborhood. A band of women dancers led her procession while young men of the neighborhood danced in front of them. Before a year had passed in the marriage, Madbuli had started to use opium and had become addicted. He lost his half of the shop without realizing it. He would take what he needed from his partner to buy opium, who welcomed the money slipping between his hands, until he no longer owned anything. He didn't even know himself that day when he went with his partner to sign over his half of the store. Though it's a day that Saniya would never forget. Her oldest daughter was nursing and she was pregnant with her second girl. Someone told her he's selling his lot of the store—she slapped her cheeks, tore her dress and for the first time since marrying she maligned her husband, cursing him in front of her neighbors. Her world was unraveling and she could never take refuge at her mother's. Instead she took refuge in her sewing machine, deciding to leave her house and rent another one, to find a place that didn't remind her of that initial happiness. She settled in Turk's Lane. In this room she lives her life between the jaws of the sewing machine that her excessive love for her four children flowers. Her relationship with her husband became a strange one, sometimes she pitied him and other times she stole a glimpse of the vestiges of their old love, and yet other times she reviled him, crying and screaming and blaming him for her shame. On dark days, it was the smiles of her children that radiated warmth. She tried to answer their dreams by the pain in her back that the sewing machine had helped to curve. The women around her with their persistent demands, "The lace, it's a bit tight." "Too bad, the color of the buttons don't go." "Dear god, bless your hand, Umm Fatha." They aren't happy because it's a holiday, but because of the new clothes. They don't buy a lot of clothes around here, and for that reason they don't leave a lot at Abla Saniya's. The people of Turk's Lane are like the people in the alleys of Cairo and the other lanes of the neighborhood. New clothes are for only two occasions: the first is for the holiday and the second is for when the holiday clothes wear out. This is mostly for the Prophet's birthday or another holiday or the sudden onslaught of winter. So, Fatima the broker gets into action, wrapping her goods from here and there. "This fabric here it's for older people and this for younger. . ." Fatima the broker allocates—as the people of the neighborhood tell it. Her relationship with them is always one of creditor and debtor, and Abla Saniya takes accounts from her because of her children, defraying her costs, and sewing her whatever she wants. Whenever the holiday approaches Abla Saniya's room crowds with women and children. She gets less and less sleep until the eve of the holiday arrives when sleep can't find any time or place in that room. Between sleeping, young ones nurse at their mothers' breasts, or sit playing with any such thing, or cry out for food and sweets, while Abla Saniya becomes a part of the sewing machine, both of them exhausted and rejecting. But through their exhaustion they forget the reason for their rejection in the midst of such a burdensome work load. Each time Abla Saniya finishes sewing a piece, she gives it to one of the girls for them to put buttons and eyelets on it. Taysir, Awatif, and Jamala, the three young girls who each dream to be the next Abla Saniya on Turk's Lane. But it is Jamala who surpasses them all in intelligence and wit, and who says, "I am Abla Saniya with improvements." She says this each time she sees her destroyed husband with a bunch of twenty-somethings under the influence of opium. The images mix and merge. One of her clients is kneading dough with her eldest daughter for cookies. Her youngest son Hassan rushes down the stairs into the room as if he had suddenly forgotten something. "Mama, Mama, where's my galabiya for the holiday?" She dropped what was in her hands and broke away from her work, hugging the child a hug worth the world, then pulling herself together she says, "God protect you and everything around you. Your galabiya, here it is!?" She places a piece of fabric on his body, but he puts it back saying, "No, no, I want to see it fitted, or are you going to leave me for last like every year?" She whispers in his ear, seizing the opportunity of her mouth next to his cheek to kiss him, "As soon as I get the money from the customers I will put three brand new shillings in each pocket." He cheered up, rushing toward the other kids with the fabric in his hands, "My galabiya, Mama . . . will you finish it before the holiday starts tomorrow?" The boy runs and her glance follows after him, overcome by the work that she must do in what remains of the exhausting holiday eve. At the end of the night the customers are half asleep while the children are sprawled out on the ground asleep as if someone had sprayed them with insecticides they collapsed like flies. Trails of chiding sentences interrupt her as she works, breaking up the rest of the night. "Is that it, Abla Saniya? You've had my family's dresses for a week!" "My dear, you are the one who was late with the lace which I had asked you for." "I've come a long way, Abla Saniya. I was just at New Lane, but God doesn't like my going to Umm Shahana. The fact of the matter is I like your sewing." "Happy holidays to you too, Umm Darwish. Now it's done, just have to do the sleeves and the snaps." Saèdiya, her daughter, rubbed her eyes getting rid of the sand, "Mama, Mama where's my dress?" She stopped working and caressed her, "My dear little one, apple of my eye, you will have it in the morning, God willing, but for now, sleep." Time passed slowly through all of the toil as each customer takes their children's clothes, carrying the one who needs to be carried, and waking those who need to be woken, and walking with a new dress hanging from her arm. She smiles as she measures her children's clothes on their sleeping bodies, muttering small expressions of her love for them. "Thanks to God . . . they've grown since last year . . . Saèdiya is now four and a half hands long . . . she grew a quarter of a hand . . . last night she was three and a half hands . . . God protect you . . . "
The sewing machine turns quickly, mechanically, and as she sews the clothes joy pulls her attention away from the exhaustion. She puts on the finishing touches and sets a new gown next to each of her little ones. She takes out a small satchel of money from inside her shirt, and choosing the newest bills she places three 50 pound notes in each child's pocket. The need for sleep overcomes her eyes and she is laden with dizziness. She succumbs to defeat after covering the children and her sewing machine, bending her body over to sleep. And so begins the holiday on Turk's Lane. A poem about a self-sacrificing "mother" from Mexico's indigenous Purépecha culture. From Japan, another story that includes vivid descriptions of sounds. The holiday in the title of this story is Eid al-Fitr, the three-day feast marking the end of the month of Ramadan and its requirement of daily fasting for Muslims. Originally published over twenty years ago, the story portrays an independent but impoverished woman, earning a living as a seamstress after leaving an unhappy marriage. A traditional Egyptian men's robe. Originally published in January 2006 issue of Words without Borders -- Words Cannot Be Weighed: Literature From Egypt. Na'am al-Baz is an Egyptian journalist who has written for the newspaper Al-Akhbar. Alexa Firat is a professor of Arabic, modern Arabic literature, and cinema courses at Temple University. Her scholarly writings and reviews can be found in print and online at Middle Eastern Literatures, Journal of Arabic Literature, The Oxford Handbook of the Arabic Novel, and more. Her translations have appeared in The Book of Gaza and The Anthology of Saudi Arabian Literature. She translated Khalil Sweileh’s award-winning novel Writing Love. Find out why "Eid clothes" are an important part of Ramadan in Festivity at the end of Ramadan. Look through the photo gallery "Eve of Ramadan in Cairo." 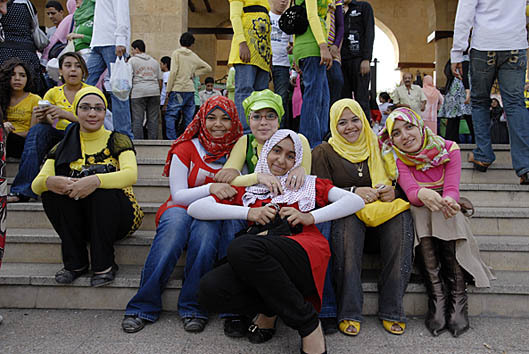 Look at photos related to Eid clothes in Egypt: Buying clothes for Eid, Guys in galibeya, Eid in Azhar park. Watch footage of Cairo in the 1980s, the time period of the story. Look at photos that show Cairo apartments: Islamic Cairo, Local family at their apartment, Colors, and Line dry. Get a glimpse of everyday life in Cairo in this photo series. Then, read an interview with photographer Elena Perlino. To learn more about the religious meaning of Ramadan, read "The Month of Ramadan and Islam." See more of Ramadan in the photo galleries Ramadan lanterns adorn Cairo's streets and Ramadan 2008 in Egypt. Look at portraits of Cairo residents, photographed in a Baroque-influenced style: In Cairo, a Painterly Cast of Characters. Cairo street crowds target women, from the BBC. Movement plans patrols to counter sexual harassment during Eid, from the Egypt Independent. Watch a video about a self-defense program to teach women to respond to street harassment. Look at Ramadan celebrations around the world: "Photos of Ramadan," from The Atlantic. Read more translations by Alexa Firat, published in Words Without Borders. Take a look at another work translated by Alexa Firat: Writing Love: A Modern Syrian Novel. Look at photos of graffiti by women in Egypt. Read about Islam on the site ReligiousTolerance.org.